Icebergs and ice islands (large, tabular icebergs) are challenging targets to survey due to their size, mobility, remote locations, and potentially difficult environmental conditions. 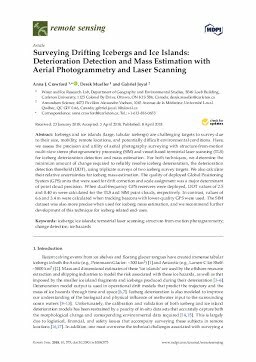 Here, we assess the precision and utility of aerial photography surveying with structure-from-motion multi-view stereo photogrammetry processing (SfM) and vessel-based terrestrial laser scanning (TLS) for iceberg deterioration detection and mass estimation. For both techniques, we determine the minimum amount of change required to reliably resolve iceberg deterioration, the deterioration detection threshold (DDT), using triplicate surveys of two iceberg survey targets. We also calculate their relative uncertainties for iceberg mass estimation. The quality of deployed Global Positioning System (GPS) units that were used for drift correction and scale assignment was a major determinant of point cloud precision. When dual-frequency GPS receivers were deployed, DDT values of 2.5 and 0.40 m were calculated for the TLS and SfM point clouds, respectively. In contrast, values of 6.6 and 3.4 m were calculated when tracking beacons with lower-quality GPS were used. The SfM dataset was also more precise when used for iceberg mass estimation, and we recommend further development of this technique for iceberg-related end-uses.